Welcome the Jul season with the celebration of Lucia. Follow the candlelit pathway to the GammelKyrkan for a brief Swedish prayer service. (Dress warmly—this church dates back to 1856 and has no heat.) Afterwards, join us across the street at the Community Center for a full Lucia Jul Fest Breakfast with special guests; the Svenskarnas Dag Girls Choir which presents their lovely music program that honors Lucia and her ministry of bringing light into darkness. 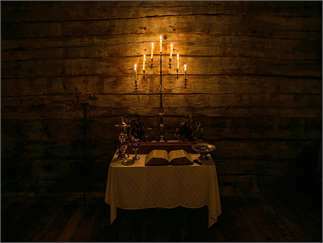 Gammelgården’s large exhibit of Lucia artifacts will be on display during the month of December for your enjoyment in our Passage Room of the Välkommen Hus. 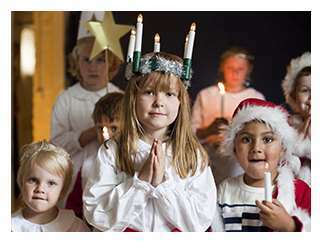 Lucia Dagen is a family tradition for all ages. Click here for the full Lucia story.